Charleston, SC (Law Firm Newswire) January 15, 2018 – South Carolina’s Steinberg Law Firm, whose head office is based in Charleston, offers an annual book scholarship for high school students. The project is an ongoing part of the personal injury law firm’s long-time commitment to child literacy. The scholarship is awarded on the basis of the strength of an essay submitted dealing with the topic of how an individual’s effort, rather than money, can make a difference. The essay must be between 350-700 words. Applicants must submit a certificate from their school confirming their eligibility to graduate the following spring. Essay entries are accepted from students from September 1 until the November 3 deadline. 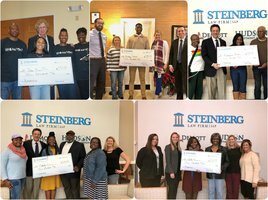 The Steinberg Law Firm and The Royal Foundation then announce the winners of five $500.00 college book scholarships at the annual Charleston Youth Summit held in December of each year. The annual Charleston Youth Summit was created under the auspices of the Mayor’s Youth Commission (MYC) after the 1999 shooting at Columbine High School. Its intention is to bring students together to talk about important concerns as a larger group and hold workshops geared toward issues youth deal with throughout the year. The Steinberg Law Firm congratulates every recipient of the 2017 Book Scholarship.